Jean & Henry Dauberville, Bonnard, Catalogue raisonné de l’œuvre peint, 1906-1919, vol. II, Paris 1968, p.359, no.834, illus. In 1912 Pierre Bonnard bought a house, which he named Ma Roulotte (My Caravan), at Vernonnet on the Seine. It was close to the pretty town of Vernon and a few miles west of Giverny, where Monet had lived since 1883; the artists became good friends. From 1909 Bonnard had also discovered the Côte d’Azur, visiting every year and acquiring a home at Le Cannet, above Cannes, in 1926. His landscapes are a delightful alternation between the light of the Midi and the lush, green, rain-drenched Seine valley, or sometimes a dreamlike entwinement of the two. Bonnard spent 1915, the year this painting was made, working in his rented house at Saint-Germain-en-Laye and at Vernonnet, the events of the First World War making more distant travel difficult. This view is taken from the balcony of Ma Roulotte, overlooking the Seine and the wild, lush garden. Bonnard’s biographer and patron, the publisher Thadée Natanson, commented: ‘The house was….located in the centre of the garden, where Bonnard greatly liked to hoe and even more to dig, water, and do all kinds of gardening except restricting the growth of the plants and flowers’. 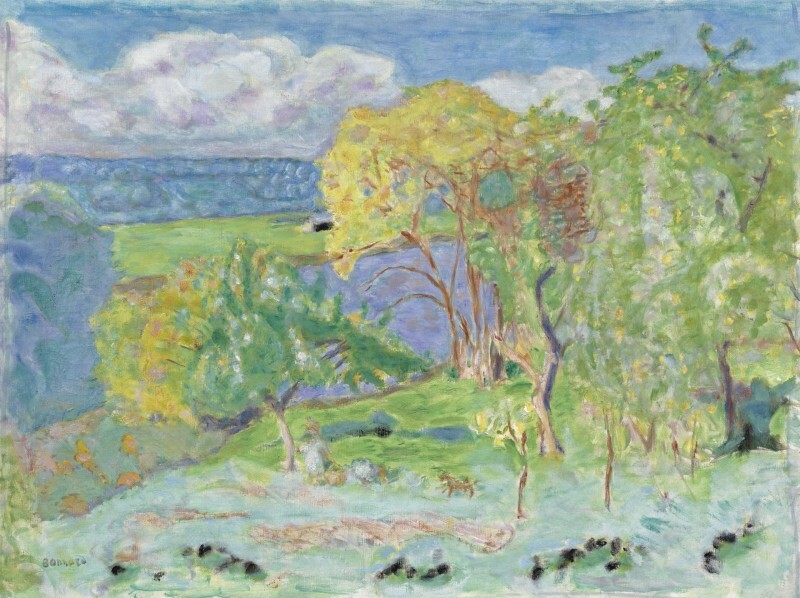 In the years before 1915 Bonnard had explored the decorative qualities of nature, working on large landscapes such as the triptych for the Russian industrialist Ivan Morozov, Mediterranée, 1911 (Hermitage, St Petersburg) and L’été en Normandie, 1912 (Pushkin Museum, Moscow), which is taken from a similar viewpoint to Paysage d’automne. While being sensitive to topography, Bonnard was interested in the abstract patterns of landscape. As Nicholas Watkins comments, he was concerned to ‘integrate form and structure with an overall atmosphere of light’. Bonnard famously described painting as ‘a sequence of marks which join together and end up forming the object, the fragment over which the eye wanders without a hitch’. The magic of Paysage d’automne lies in the way in which the elements of the landscape coalesce on the picture surface in a shimmering tapestry and then reconstitute themselves into a steeply angled garden, a river and distant hills topped by scudding clouds. The Seine, half-buried in luxuriant vegetation, tones with the blue-greens of the shadowed tree to the left and the woods on the far bank. The central band of the painting is lit up by the vivid yellows of autumn leaves. The fecundity of nature, even in its autumn phase, is echoed in Bonnard’s riotous brushwork, from the loosely-painted clouds, shadowed in lilac, to the staccato handling of the trees, swirls of green with firework-cascades of yellow and scribbles of purple. Graphic elements, describing tree trunks and branches, lightly hold this chaos in check. Right before our eyes, Marthe, Bonnard’s mysterious wife and muse, gathers a basket of apples, accompanied by the family dogs which appear in so many of the artist’s works. The goddess of this Arcadia, she is painted with the most subtle of touches, half-subsumed into this landscape which represented for Bonnard a timeless idyll. Unlike the Impressionists, Bonnard did not paint his landscapes in front of the motif. He preferred to make small drawings and colour notes on the spot, which he translated into oil paintings in his studio. His landscapes are imbued with memory and emotion as well as the transient appearance of nature. He expressed his philosophy to Matisse in 1940: ‘During my morning walks I amuse myself by defining different conceptions of landscape – landscape as “space”, intimate landscape, decorative landscape, etc. But as for vision, I see things differently every day, the sky, objects, everything changes continually, you can drown in it. But that’s what brings life’. This painting was formerly in the collection of the Swiss industrialist and philanthropist Oskar Reinhart, whose vast collection encompassed Old Masters, German Romantic painting, Impressionism and Post-Impressionism. Much of the collection was given to the Swiss Confederation and today is housed in Reinhart’s house Am Römerholz and the Oskar Reinhart Museum in Winterthur. Born in a Paris suburb in 1867, Pierre Bonnard was the son of a bureau chief in the Ministry of War who encouraged his son to pursue a classical education followed by a career as a barrister. In 1885 Bonnard enrolled in law school and received his degree in 1888. Throughout his law studies he attended art classes at the Académie Julian and was accepted at the Ecole des Beaux Arts. It was during this period that he met a remarkable group of young artists, including Paul Sérusier, Maurice Denis and Edouard Vuillard, who became lifelong friends. Bonnard soon developed a strong bond with Vuillard and readily joined the group of artists, led by Sérusier, who called themselved the Nabis (‘prophets’ in Hebrew), who were particularly influenced by Paul Gauguin and whose main aim was to develop the ideals of Impressionism. The group caused considerable outrage in Paris and during the Exposition Universelle in 1889 they controversially showed their work at the exhibition organised by Gauguin at the Café Volpini near the newly erected Eiffel Tower. By the age of twenty-two Bonnard was still a practising lawyer and by the end of 1889 became a licensed attorney. He soon became disillusioned by his daily routine in the Paris law courts and in 1891, after receiving one hundred francs from France-Champagne for a poster commission, Bonnard chose to give up law completely to concentrate on his artistic career. That same year he submitted his first entries to the Salon des Indépendants which were well received by the critics; he continued to be an active and committed member of the Nabis. Bonnard’s early works have a clear palette and bold execution which are clearly influenced by the Symbolist poetry of Mallarmé and the teachings of Gauguin and Sérusier. In 1893 Bonnard met his lifelong companion, the beautiful Marie Boursin, whom he encountered on the boulevard Haussmann in Paris when she introduced herself as sixteen-year-old Marthe de Méligny, the daughter of aristocratic Italian parents. It was not until after their marriage some thirty years later that Bonnard discovered her real identity: she was a farmer’s daughter from the Midi and had been twenty-four at their first meeting. Described as ‘voluptuous’ and ‘almost risqué’, Marthe became central to Bonnard’s work, appearing in one hundred and fifty paintings and over seven hundred sketches. By 1900 Bonnard had been working with the Nabis for nearly a decade and felt that he needed more independence to develop his personal style. He began to travel extensively within France and abroad, visiting Belgium and Holland in 1907, Italy in 1910 and 1922, England, Spain, Algeria, Tunisia and America in 1926, widening his experience and expanding his horizons. In 1909 he joined Henri Matisse in a painting expedition to the South of France which had a remarkable effect on the future of his work. Seduced by the bright sunlight and bold colours of the Mediterranean, he discovered an overwhelming passion for colour which from this moment became of primary importance in his art. In 1912 Bonnard bought a house in Vernon in the Eure region, near Monet’s beloved Giverny, where he and Marthe lived most of the year, only escaping to the warmth of the Côte d’Azur in winter. Bonnard continued to paint sunlit interiors peopled by his family and friends and his works developed into intimate portrayals of his personal life. In 1931 he settled permanently in the villa at Le Cannet, which he had purchased in 1926. This became the subject of his glorious golden canvases and he continued to paint there until his death in 1947. Le Bonnard que je propose, Geneva 1951, p.81, quoted in Canberra, National Gallery of Australia/Brisbane, Queensland Art Gallery, Pierre Bonnard: Observing Nature, 2003, exh. cat. by Jörg Zutter, p.54. Nicholas Watkins, Bonnard, London 1994, p.134. Quoted in Watkins, op. cit., p.134. Quoted in Canberra, Pierre Bonnard, op. cit., p.61.